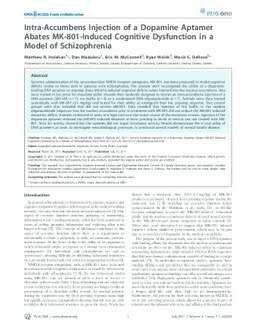 Systemic administration of the noncompetitive NMDA-receptor antagonist, MK-801, has been proposed to model cognitive deficits similar to those seen in patients with schizophrenia. The present work investigated the ability of a dopamine-binding DNA aptamer to regulate these MK-801-induced cognitive deficits when injected into the nucleus accumbens. Rats were trained to bar press for chocolate pellet rewards then randomly assigned to receive an intra-accumbens injection of a DNA aptamer (200 nM; n = 7), tris buffer (n = 6) or a randomized DNA oligonucleotide (n = 7). Animals were then treated systemically with MK-801 (0.1 mg/kg) and tested for their ability to extinguish their bar pressing response. Two control groups were also included that did not receive MK-801. Data revealed that injection of Tris buffer or the random oligonucleotide sequence into the nucleus accumbens prior to treatment with MK-801 did not reduce the MK-801-induced extinction deficit. Animals continued to press at a high rate over the entire course of the extinction session. Injection of the dopamine aptamer reversed this MK-801-induced elevation in lever pressing to levels as seen in rats not treated with MK-801. Tests for activity showed that the aptamer did not impair locomotor activity. Results demonstrate the in vivo utility of DNA aptamers as tools to investigate neurobiological processes in preclinical animal models of mental health disease.